Sonifex celebrated their 50th anniversary this week with a staff party at Wellingborough Golf Club. Sonifex designs and manufactures audio products for the radio and TV industry and currently exports more than 70% of its products. The company was founded by Paul Brooke in April 1969, started in the front room of his house in Wellingborough, UK. Paul had trained as an electronic engineer at Marconi and had been made redundant from an electronics job in Northampton. He used the 6 months redundancy period to start designing and making a mixer that he could sell to film and recording studios in London. Doing bespoke electronic design work became his trade and in 1973 he moved to a factory in Irthlingborough. 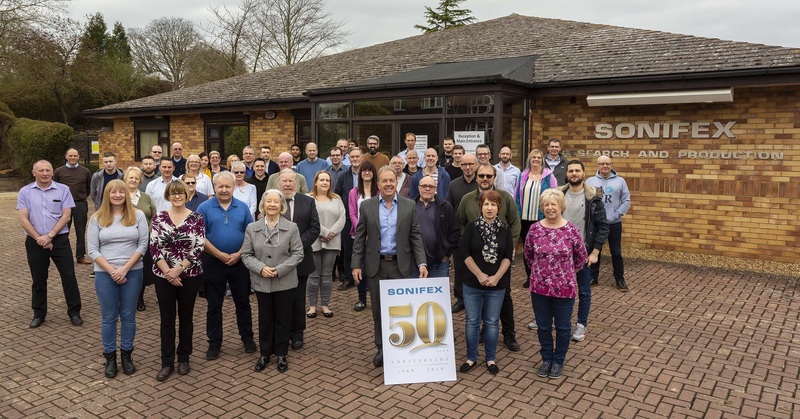 In the late 70’s and early 80’s, Sonifex become well known for designing and building successively better cart machines, used for playing radio jingles, and higher sales meant, in 1985, moving the company to where it is today, a purpose-built factory on Station Road in Irthlingborough. Cart machine sales increased rapidly during the late 80’s (at one point, there was a 35 week lead time for cart machines from Sonifex). The business was very much a family one with Dorothy, Paul’s wife, and his sister-in-law Vivien doing the accounts, his sons Andrew and Marcus working in production and design, but also his mother-in-law, another sister-in-law, nieces & nephews, and eventually grand-children, also playing a part in the company at some point. In 1994, Paul’s son Marcus Brooke took over the company as MD, with Paul and Dorothy retiring shortly afterwards. The big increase of new products that Sonifex created since the late 90’s was down to them trying to keep a step ahead in a technology based industry which kept making existing products outmoded: cart machines were redesigned to floppy disk cart machines to PC based playout systems; tape based loggers to hard disk based loggers to software loggers; analogue audio to digital audio to now IP audio. Sonifex have had to reinvent themselves continually. The Redbox range of analogue and digital audio interfaces grew and became an industry standard - you can walk into any engineering racks-room and pick them out immediately with their distinctive red colour. Sonifex is a true British manufacturer. All Sonifex products are designed and manufactured in house at their factory in Irthlingborough. The R&D team comprises staff doing analogue and digital circuit design, hardware and software design. A surface mount manufacturing line was introduced in 1996 and replaced with a newer line in 2011, able to place the densest BGA FPGAs and the smallest components. An engineering workshop has CNC machines to manufacture the product chassis, front and rear panels with some of the best engineering standards in the industry. With over 150 different product lines to manufacture, Sonifex have refined their production and purchasing methods to build small batches of products, with a policy of continuous improvement and efficiency which pervades the operations. Checking production records, Sonifex estimate that there are roughly a quarter of a million Sonifex products on the market, with the majority of those sold to over 120 countries worldwide.